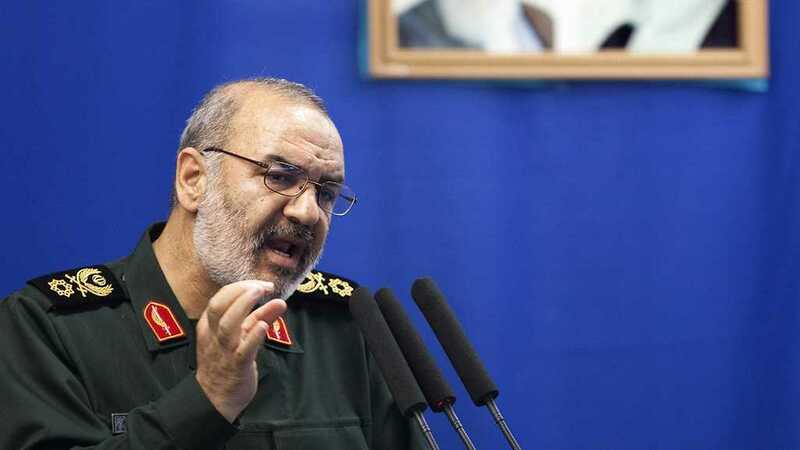 Commander of the Islamic Revolution Guards Corps (IRGC) Brigadier General Hossein Salami blasted the “Israeli” prime minister for fabricating the realities on the ground and promoting Iranophobia, and said that Benjamin Netanyahu will take his dreams to grave. “Netanyahu should know that there is no way for him except fleeing the region and so he needs to learn how to swim in the Mediterranean Sea,” General Salami said on Friday, addressing a group of IRGC commanders and officers in the city of Isfahan in Central Iran. He underlined that the enemy was planning to create a new Middle East led by the “Israeli” regime, but all their dreams turned sour. “The US says it has spent some $7 trillion in funding wars across the region, but with the will of God and resistance of nations, it has not been able to gain anything from it and has faced defeat,” Salami added. “Israel” is estimated to have 200 to 400 nuclear warheads in its arsenal. The regime, however, refuses to either accept or deny having the weapons. It has also evaded signing the Non-Proliferation Treaty (NPT) in flagrant violation of a UN Security Council resolution amid staunch endeavor by the United States and other Western states on international levels in favor of its non-commitment to the accord. Iran has repeatedly announced that its nuclear program is merely for peaceful purposes and poses no threat to the international peace and security. Iran’s nuclear facilities have been under the constant monitoring of the International Atomic Energy Agency for the last two decades. But a nuclear accord signed by Iran and six world powers in 2015 placed the country under even stricter rules of supervision and inspection. Yet, the UN nuclear watchdog has underlined in 12 reports under the deal as well as dozens of more reports prior to the endorsement of the Joint Comprehensive Plan of Action (JCPOA) that there has never been any anomaly at Iran’s nuclear program to indicate a move or drive towards a military nuclear capability, reasserting that the country’s nuclear program has remained strictly loyal to its stated “peaceful purposes”. Back in June, the Iranian foreign minister decried the “Israeli” entity’s nukes as a real threat to the Middle East region and the rest of the world, calling for a new focus on the occupying regime’s nuclear arsenal. Iranian Foreign Minister Zarif posted a message on his official Twitter account, saying although Iran had no nuclear weapons, the entity, which is the sole Middle Eastern country to possess such weapons, continued to “howl” about “fabricated” Iranian “ambitions”.